Artichokes are in season in France and Greece now. They have started to show their pretty purplish head in supermarkets here at home and they make a great snack or shared started. I am pretty new to cooking and dealing with artichokes. 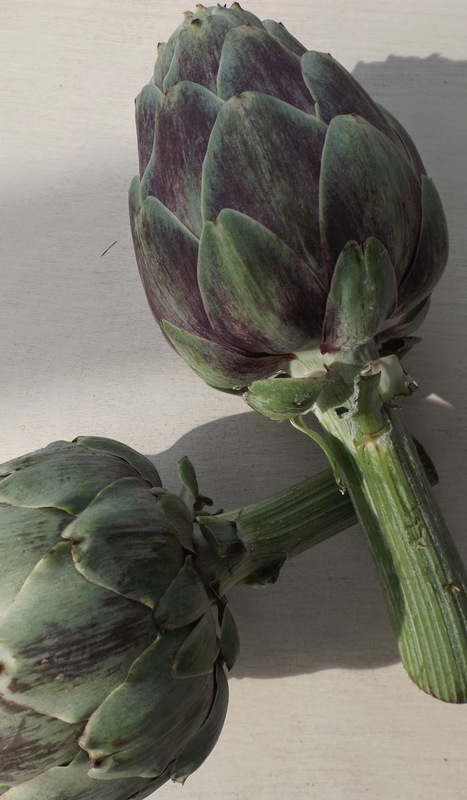 One of my best girlfriends from university spends half her time in France and is always raving about the beautiful artichokes they get there. While I can't compete with local produce I thought i would experiment with a couple of recipes. Not being sure on the best way to cook them I decided to go with two methods. First the steaming whole method and second the cut and remove choke first then steam and grill method. Both are easy, but personally the prepare, steam and then grill method worked best. The artichokes were easier to enjoy once the choke had been removed prior to cooking and finishing them off under the grill made them deliciously crispy. Pairing the juicy leaves with a homemade saffron aioli made them even more tasty! 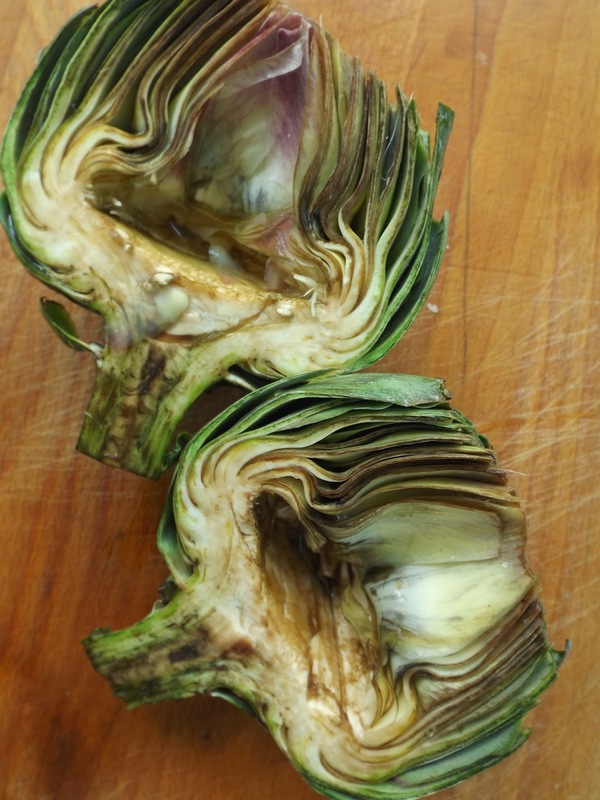 Once you have scraped out the choke and sorted out the mess you should be left with your two artichoke halves looking like this. Fill a pan with half an inch of water, a clove of garlic and a wedge of lemon. 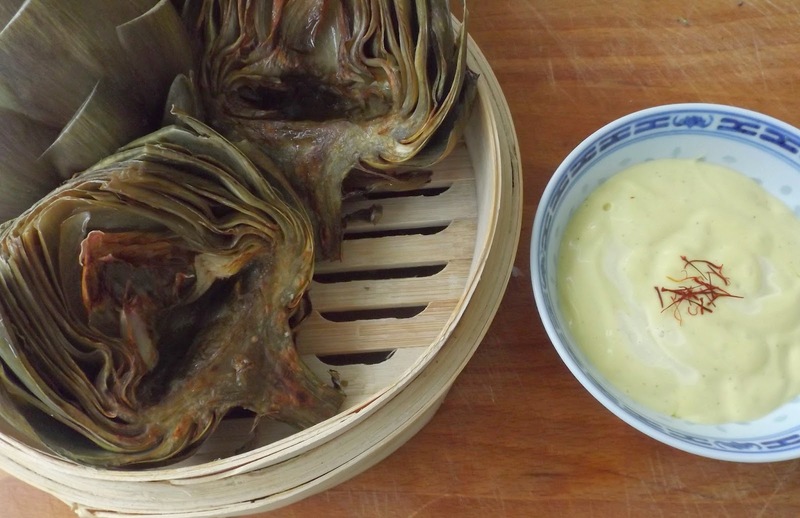 Then place a steamer on top place your artichoke face down onto the steamer and let cook for 20 minutes. While you wait for that to cook you can get on with your homemade saffron aioli. I am using an old family recipe - with a few changes. Put your egg, sugar, salt and pepper, vinegar and mustard powder into a blended and slowly add all the oil. until it becomes thick. Then mix through a few strands of saffron and save a few to sprinkle on top for decoration. Then get back to your artichokes. Take them out of the steamer, coat the cut side with some lemon juice and olive oil and place under the grill for 5 minutes. Once golden serve up and start tearing apart the leaves. Work your way all the way down until you get to the heart - the most prised part of the dish. all share and enjoy.